Loudoun County prosecutors honored a collection of law enforcement officers and concerned citizens for their exceptional service to crime victims during a ceremony Friday, April 5. The Commonwealth’s Attorney’s Office recognized 11 law enforcement officers and three civilians for their actions during the past year. Leesburg Police Department Detective Michael Drogin was recognized for his work in financial crimes investigations, investigating crimes that often target the elderly or vulnerable. In one case, Drogin investigated a case involving an adult victim with the mental age of a child, and went out of his way to bring in Adult Protective Services, the Children’s Advocacy Center, and the Commonwealth’s Attorney. Ultimately, he was unable to find a perpetrator, but was celebrated for “going the extra mile” and treating victims with respect. Loudoun County Sheriff’s Office Sergeant Nancy Johnson has been the department’s Domestic Violence sergeant since 2017. She was recognized for her part in doubling the number of domestic violence victims who received forensics exams from 2017 to 2018. LCSO Sergeant Steve Schochet and retired Detective Jay Merchant were recognized for their work in obtaining a conviction in a 30-year-old cold case, the death of Henry E. “Ricky” Ryan in 1988. In April 2018, a jury found Timothy W. Warnick guilty of murdering Ryan, and a Warnick was sentenced to life in prison. At a party near the Shenandoah River in West Virginia, Warnick and Ryan left on a beer run with a third, unknown man, but only Warnick came back. Ryan’s body was discovered in a shallow grave by Rt. 9 near the Loudoun County border the next year. Merchant, who worked as a law enforcement officer from 1963 until 1998, was the detective originally assigned to the Ryan case. Although he zeroed in on Warnick as a suspect, he was never able to get a warrant for his arrest during his career. But when the cold case unit reopened the investigation, Merchant did everything he could to help. Schochet has worked in Loudoun’s cold case unit sine 2013, and has worked on high-profile cases like the Braulio Castillo and Danny Centeno Miranda murders trials. Today, his is in charge of the robbery/homicide squad. He took over the Ryan case in 2016, re-interviewing several witnesses and eventually gathering enough evidence to charge Warnick. The ceremony also recognized the sheriff’s office’s Crash Investigation Unit and Motor Carrier Safety Unit, including Sergeant Raymond Gessner, and deputies Sean Allen, Doug Lake, Ron Beach, John McClintic, Michael Petrakos, and Brian Russell. The unit investigated 841 reportable crashes and nine fatal crashes in 2018. They are often responsible for figuring out what happened in a crash victim or defendant’s life in the hours or days leading before a collision. Mary Hale has worked in victim services for nearly 20 years in shelters, the court system and with the military. 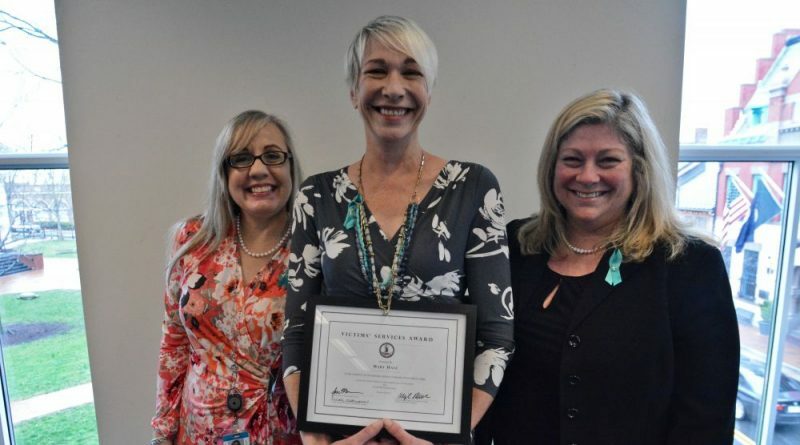 She was instrumental in helping win grant funding and space for the Forensic Assessment and Consultation Team, or FACT, at Inova Loudoun Hospital’s Cornwall campus, saving victims an hourlong trip to the next-nearest facility. Today she supervises the nurses who provide sexual assault and forensic exams. Hale and FACT are also credited with doubling the number of women who underwent a forensic exam after an incident of domestic violence from 2017 to 2018. Michael Scurto was recognized for his actions on Dec. 31, 2017, when he saw Muhammed Khalid struck and killed by a car while he was walking home on Loudoun County Parkway from his job at Walmart. Scurto saw the driver try to leave. Scurto stopped his car in front of the driver to prevent him from leaving the scene and called 911, staying at the scene until law enforcement arrived. And Fariha Ibnan was recognized for her work as a foreign language interpreter in the schools, the courts, law officers, and for nonprofits such as the Loudoun Abused Women’s Shelter. In particular, in March of 2018, she saw a victim arrive in court to show the prosecutor how the victim’s husband had once again beat her, and helped the victim immediately give a statement to a law enforcement officer. When the victim confided in Ibnan that she had no transportation—and had taken a ride with a stranger to get to court—Ibnan gave the victim a ride home that day, and volunteered to help with transportation for the victim from then on. Ibnan was born, raised and obtained her master’s degree in English literature in Pakistan, moving to the U.S. 20 years ago with her husband and two children. She is fluent in Urdu, Hindi, and Punjabi.